We got in late Friday night and hooked up with my parents at the hotel. We are staying out of the frenzy about 15 miles from town. Out here things are busy but there isn’t much marathon activity. Keeps me focused. However, it was time to venture into the heart of the beast today for packet pick-up. At a “normal race” this is a 5-30 minute exercise. Not at Boston! Its an event all by itself. We made the drive down into heart of Back Bay (section of Boston) and got onto Boylston Street. As we drove down the road, I passed the convention center where pick up was so we had to swing back around. However, I couldn’t resist driving under this seemingly arbitrary yet famous landmark — the finish line! Be back soon. We found some parking in a garage and made the walk through a few mall areas connected by skywalks. The good news here was that it was raining outside and our crew stayed nice and dry as we roamed around inside of Boston — so to speak. We followed signs to the convention center. 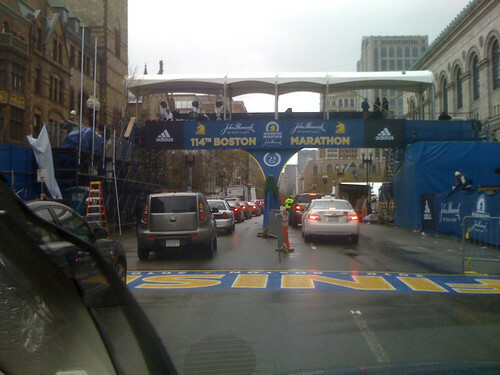 As we got closer and closer, more and more people were sporting their blue and yellow 2010 Boston jackets. It looked like they were giving them away up ahead. We kept following the crowds and they got thicker and thicker. Finally, I made my way into bib pickup. The guy checked my ID and told me “congratulations on making it here”. For a brief second, I got a chill. Yeah, I did do a bit of work to get here. Thanks, dude. People were taking photos everywhere during bib pickup so my family made me do one too. We went down and grabbed the goodie bag and then went into the expo. What a zoo! The building should have been 2x the size. People were jammed everywhere looking at every random running product you had ever seen. I went right into the Adidas booth and picked up my own ugly Boston jacket because you have to buy one and then we got out of there. Apparently, Ryan Hall was in there signing away. I probably could have browsed around for 2 hours if I had wanted to check everything out. That would have been me a few years ago. Now, it kind of felt like — that’s not what running is about (for me). We floated out along the sea of humanity and found a place to eat a late lunch. I was sort of worn out. So many people. So hot. That was nuts. On the way out, I noticed we were at the foot of the Prudential building which is a landmark itself here in Boston. Its probably not the tallest but it sits alone a bit and would offer a great view. As it happens, you can go up the 50th floor and see the sights. 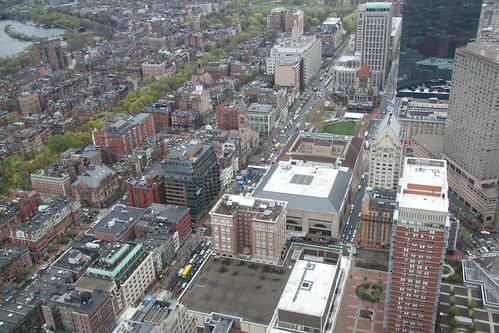 So we boarded the elevator and cruised up for a look over Boston. It ended up being clear enough out that we could see from the ocean to the hills in the west. So here is a look nearly straight down at the finish line. See the white thing going across the street? 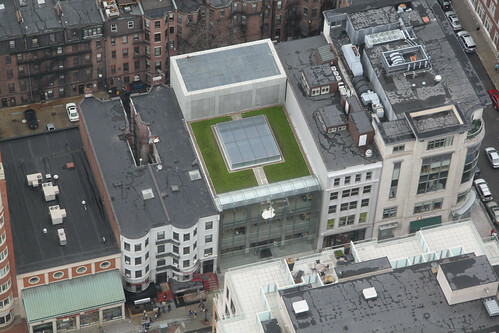 Oh, and just near the finish line right on Boyleston — the Apple Store. See the green roof top? Looked like grass. This is good to know — what if I drop my iPad during the race or something? Fan boys, rejoice. Back to race recon…so looking out the opposite side of the building from the finish line. We should be able to see the starting line. Not. 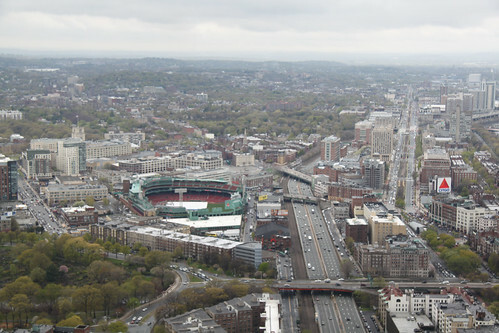 There is Fenway Park and the Citgo sign. You could make out a ridge that ran across the hills behind that. Heartbreak Hill must be somewhere along the crest of that. So that is at mile 18 or so. Then we start 18 miles back from there. Crap. I am not even sure if we can see that far. It is always fun in a point to point race to try and visualize the distance to be covered. We drove back to our hotel to leave my kids with my parents for an evening out. We went into Cambridge and met up with Glenn Hahn and his crew (including Stuart Taylor!) for dinner at a nice spot they had picked out. Talked about everything and enjoyed the food. Glenn said I should “pull a Luke” so here you go. 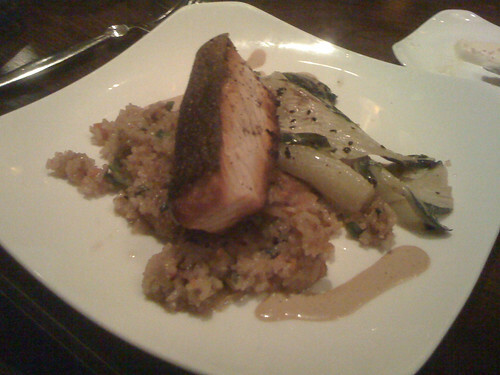 Dinner is served — salmon with jasmine rice and bok choy. Glenn was surely my main influence in getting here to Boston. When I didn’t run, he talked about Boston. When I started to run, he would tell me about Boston. And when I said, hey maybe I should try for that, he encouraged me to get to Boston. 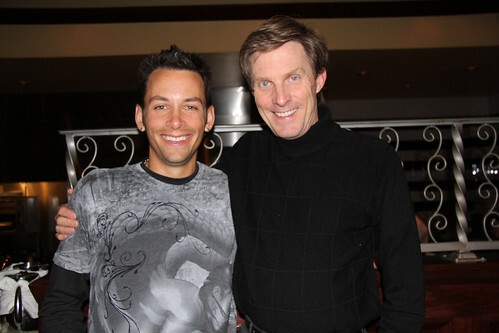 I probably would have been at home this weekend if it were not for Glenn’s influence. 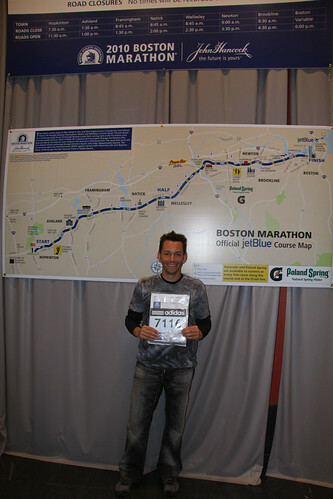 He says its all going to be worth it on the 26.2 mile run back to Boston on Monday. Hope he is right! Its his 9th time so I figure he knows what he is talking about. If you are just tuning in, we race on Monday — Patriot’s Day. So another day of random adventures before the action!